Powdery mildew fungi symptoms are small dusty-white patches that develop by mid-summer. Although this disease rarely results in sufficient injury, its high visibility is a frequent cause of concern. Fungal leaf diseases can be visually unpleasant and frustrating problems to control because once the symptoms are visible, it is usually too late for effective treatment that season. 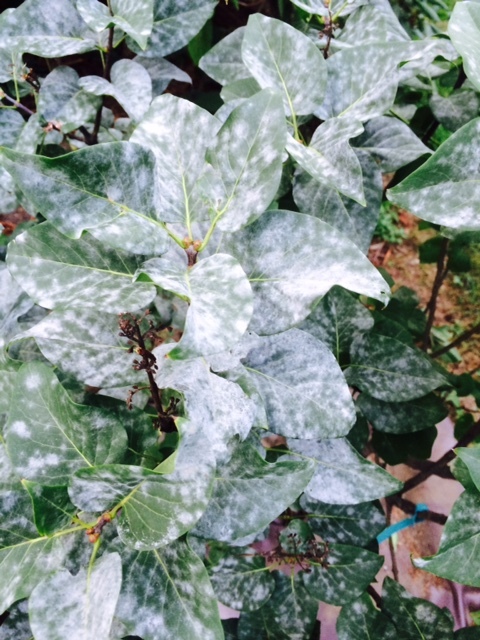 The typical foliar disease life cycle begins in early spring as spores from dead, fallen leaves or dead twigs become air-borne infecting young, susceptible foliage. 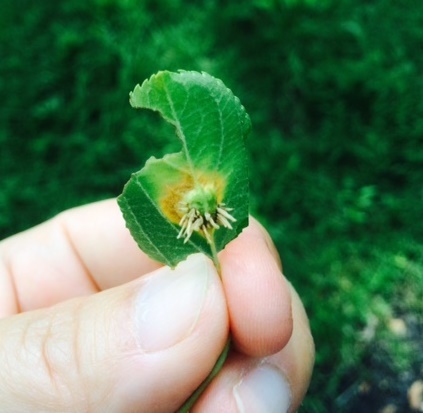 Later in spring and early summer, fruiting structures form on infected leaves and additional infections occur. Foliage must remain wet for a period of several hours for spores to germinate, so persistently cool, moist weather is ideal for fungal leaf-disease development. Irrigating in early evening and maintaining dense plantings can exacerbate the environmental conditions that favor disease development and infection. In late summer and fall, the infected leaves drop and the cycle repeats the following year. Raking and disposing of fallen leaves may help reduce the source of next year's infections. While this may be helpful in certain instances, it is nearly impossible to eliminate all the infected leaves from a property. Managing foliar diseases can be tricky. If fungicide treatments begin in the summer when the symptoms appear, it's too late for control. Effective management requires precise timing and persistence. Rusts are unusual fungi in that they may require two unrelated hosts to complete their life cycle. Rust fungi produce fruiting bodies on one host species, which releases spores that only infect the secondary host species, and the cycle repeats. Has the disease been correctly identified? Has the tree withstood several years of partial or complete defoliation due to this disease? Has the tree recently experienced heavy stress from other pests or disorders? Is the disease life-threatening to the tree? Is the host tree so valuable or visible that the loss of some foliage is a significant concern client? Are you prepared that several fungicide applications may be necessary this growing season and in the future as the disease is likely to return again next year? If you answered "no" to any of these questions, it may not be appropriate for you to treat-at least without additional information. If you have concerned with foliar diseases on your trees and shrubs, contact a Certified Arborist at BTSE to discuss strategies for protecting your important plants.